Bullying has been around as long as there have been people, but it is not an inevitable condition that we as a society have to give in to. New approaches are starting to make headway as schools and parents tackle this issue that will not go away. 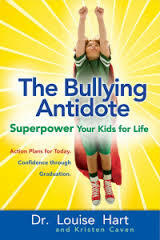 Last week I attended a book launch at Laurel Books for The Bullying Antidote: Superpower Your Kids for Life, written by my friend Kristen Caven and her mother, Dr. Louise Hart. It was a warm, muggy night in Oakland, so the door was opened in Luan’s cozy little bookshop to allow the occasional breeze to provide some relief. A small but engaged audience of parents and teachers listened to the authors present ideas based on both science and experience. Hart is a community psychologist who has studied school environments and is an expert in self-esteem development. Caven is a writer who is actively involved in the parent association where her son attends high school. (She also happens to be an active member in the California Writers Club, which is how I know her.) Together they have compiled information that explores the topic quite thoroughly. One major aspect of this issue has to do with different parenting styles. Nobody sets out to raise a bully or a victim (or at least I hope nobody does! ), but any sort of extreme parenting, whether permissive or autocratic, leaves its mark on our children. Through positive parenting, the authors suggest that we can help turn the tide on a trend that has contributed to the bully/victim dynamic. Recognizing patterns, understanding motives, and focusing on effective communication are all part of a multi-pronged approach to dealing with this prevalent problem. During the question and answer portion of the presentation, a young man shared his recent experience as a substitute camp counselor. Neither a teacher or a parent, he hadn’t known about the book event. He just happened to be walking by and impulsively entered the open door. Then something about the topic piqued his interest, and he stayed. His own father, he admitted, was less than an ideal parent, but rather than putting energy toward resenting him, this young man seemed bent on breaking that cycle and taking what he learned to heart. It’s possible that, as it often is, the authors were mostly preaching to the choir, considering those assembled. But even if just one young person really understood the advice being offered that night, perhaps it will influence his choices and actions, spurring a ripple effect that will touch many. It may be a romantic notion, but hope thrives on such notions, doesn’t it? This is an important topic and deserves an extra distribution boost. 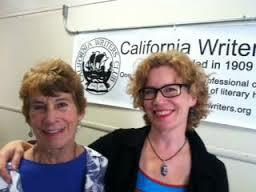 The blogger and the author are both personal friends and colleagues in the Berkeley Branch of the California Writers Club, I welcome the opportunity to give their message extra air time. I’m going to share the title of this book with my neighborhood e-mail list called “Next Door.” Most of the young families here have children. Thanks for sharing it. Thanks for the report, Tanya! It was so interesting when I asked for a show of hands halfway through and found out 75% of the attendees were teachers or retired teachers! I’ve heard teachers say they can tell which kids are raised with positive parenting (democratic, i.e. the middle path) – they are ready to learn and don’t get into the emotional battles other kids do! I hope this book can go a long way towards making their jobs easier. A report from of our first bookstore appearance by blogger & children’s writer Tanya Grove!